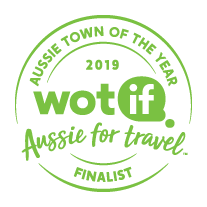 We’ve crunched the numbers, looking at pricing, demand and all-round awesomeness, and it’s official – Warwick, QLD, is a Finalist in Wotif’s Aussie Town of the Year Awards 2019. The Aussie Town of the Year Awards recognise top Aussie destinations that offer travellers great value for money, fantastic experiences and excellent accommodation options. With its roses and rodeos, it’s obvious why Warwick was a top pick for the top ten. The first free settlement in Queensland after Brisbane, Warwick is a historic country town perched on the Condamine River. Just an hour's drive from Toowoomba and two hours from Brisbane, Warwick is a unique place to get to know country Queensland. Check out our range of Warwick accommodation below. Long recognised for its beautiful old churches, Warwick has a definite charm to it. Warm country hospitality and relaxed surrounds make this a destination that won’t wear you out. The past can still be seen in the streets today, with grand homesteads, colonial cottages and sandstone buildings adding to the ambience of Warwick. To find it all in one place, the Pringle Cottage Museum complex has a collection of late 19th century buildings, memorabilia, vehicles and machines. With strong roots in agriculture, the place to really get to know Warwick is at the weekly Pig and Calf Market. Don’t jump to conclusions! As the longest-operating market in Queensland, it offers much more than just livestock to look at. From random trash and treasure finds to furniture and even pet animals like guinea pigs, it’s impossible to find a market like this in the city. Fossicking, four-wheel driving and fishing are also great local activities to get stuck into. There are many tourist drives around the area, and camping and hiking spots in the national and state parks surrounding Warwick. Explore Queen Mary Falls, the beautiful rock formations and wildflowers of Girraween National Park or the rugged wilderness of Sundown National Park. Throughout the wider Warwick area, you can actually feel and see the four seasons – autumn in particular is a magical time to visit. 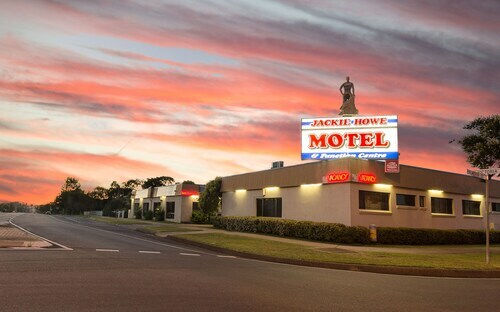 If you want to completely immerse yourself in the festivities on Warwick, then be sure to pop in for the Warwick Rose & Rodeo Festival – a renowned Australian event. The Jumpers & Jazz in July Festival is another stunning event to be a part of, when the towns trees are decked out in giant knitted jumpers and the sounds of jazz fills the streets. What a cool and colourful affair to cosy up to winter! Getting excited? To get to Warwick, just follow the Cunningham Highway from Goondiwindi or Brisbane, or the New England Highway from Toowomba. Once you’re here, you can even ditch the car and jump on a steam train ride just for the fun of it! So forget about the coast and come see what a country town like Warwick is all about. Book your Warwick hotel and get packing! How Much is a Hotel Room in Warwick? 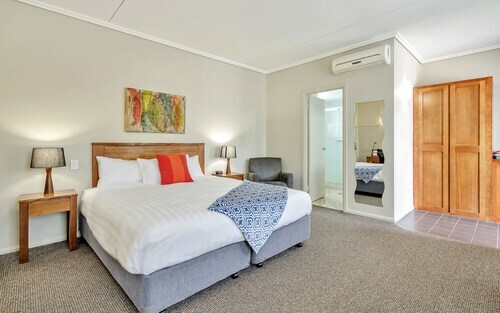 Hotels in Warwick start at AU$90 per night. Prices and availability subject to change. Additional terms may apply. Great historic building that has been lovingly restored and works well as a base to explore the local areas. Wonderful hospitality..
We liked the feel of luxury in our room and freshness throughout. The lounge provided relaxation during our pre evening meal drink, and the dinners were excellent with a wide variety of cuisine. Always gently happy, the staff made you feel indulged. There was nothing lacking. Thank you. R&M. 7 days ago by A verified traveller from Lismore. The staff were very friendly and helpful. The motel was within walking distance of shopping, and also an on site restaurant if eating out didn't appeal. Was easy to find for an out of towner. Bathrooms appear to have been very recently renovated and were very clean. Minimal road noise.